Team India has won a Test series after eight years against England defeating the guest team by innings and 36 runs. 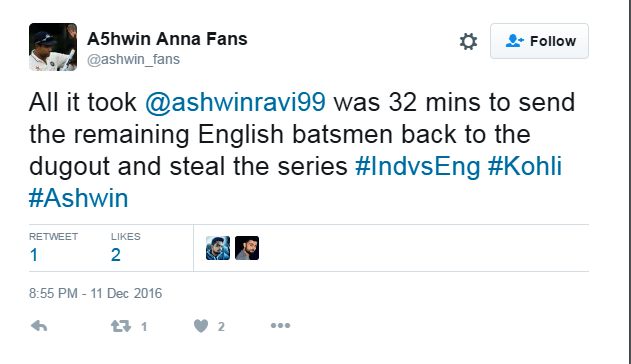 India has taken a 3-0 winning lead against England. Virat Kohli and his brigade took last four wickets within 36 minutes on the final day of the fourth test match. This series proved to be a tougher one for England. They are facing criticism from their English fans while Indian fans are celebrating this moment. Piers Morgan, a British journalist who is well known for having a battle with Virender Sehwag on Twitter, have given a weird suggestion to English Captain. 24 balls is all it took today for Ashwin to clean up England’s last 4 wickets #INDvENG. Tough Fight btwn Kohli & Ash for MOS title..